Toshi a signature Pan Asian Restaurant located on the 18th floor, features a rich buffet of specialty dishes from Japan, China, Singapore, Korea, Indonesia, Myanmar and Vietnam. From 7pm to 11pm on Christmas Eve, an array of flavourful dishes with hot and cold appetizers, salads, soups, noodles, live station for hot dishes, seafood and fresh oysters and an international desserts section will keep you in a festive mood. A live entertainment will be play your traditional Christmas carols. 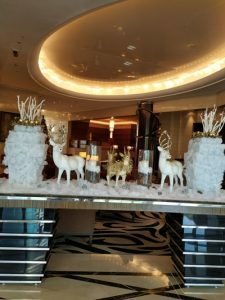 The Christmas Ever dinner buffet is prices at AED210 per person with unlimited soft beverages or AED349 per person with three hours of free flowing house beverages. Spend the most wonderful time of the year with your dearest and nearest while enjoying a lavish Christmas Day Brunch at The Atrium. From 12:30pm to 4:00pm, the dining venue comes alive with an open buffet filled with carefully selected international dishes and traditional Christmas delights. The in-house singer will bring everyone into the festive mood with his playlist of Christmas songs. Be on the lookout for Santa who will be making a scheduled appearance to greet guests, spread love and gifts for the kids. Activities include a special Christmas cinema and a clown will be present to entertain the little ones at the Kid’s play area. The Christmas Brunch at The Atrium is priced at AED195 with soft beverages and AED249 with three hours of free flowing house beverages. Kids below 12 years will get 50% discount. Bring home the festive spirit with the traditional turkey prepared by our talented Chefs served with all the trimmings for only AED499. 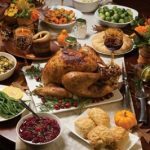 The 7-kg roast turkey with chestnut stuffing serves 6 to 10 people and is served along with herb-roasted baby potatoes, buttered carrots, caramelized Brussel sprouts, glazed chestnuts and veal, chipolata sausages, cranberry sauce and giblet gravy. A mouthwatering pumpkin pie for dessert is also included. Book your table before 15th December and get 20% off your bill. For reservation and information, please call F&B reservations at +971 4 423 4170 or email fbreservations.gmhd@millenniumhotels.com. Guests can also message Grand Millennium Dubai using the “Just Ask” WhatsApp number at +971 55 561 2122.